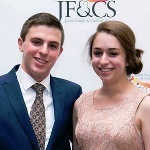 Ari, a 10th grader at the Maimonides School, and his sister Evette, a senior at the Maimonides School, shared their JF&CS story at the 2014 Benefit on Wednesday, May 21. We, along with our amazing mother, Janet, are honored to be here to help celebrate the 150th anniversary of JF&CS. Unfortunately, our sister, Adina, could not be here with us. Adina has developmental disabilities and is with her caretaker this evening. We are here tonight to tell you about our long-standing relationship with Jewish Family & Children’s Service. In 2002, our dad passed away after being ill for just a short time as the result of a brain tumor. He left our mom with three young children to care for. Evette was only six years old at the time and Ari and Adina were only four. Our situation was fragile. This was when the Jewish community stepped in. We remember very distinctly our family’s initial experience with JF&CS: that first Chanukkah after our dad died. We knew we could no longer light the menorah with our father. Our dad traditionally gave us gifts all eight nights, but given that our mother was struggling financially, she would not be able to keep up that tradition. But the holiday turned out to be a joyous one after all. Unbeknownst to us at the time, we were already receiving food from Family Table. JF&CS volunteers arrived with bags full of gifts as a result of our relationship with the agency. There were enough gifts to cover almost all eight nights of Chanukkah for the three of us! At the time, we were overjoyed, having no idea that they came from JF&CS. JF&CS allowed our family to enjoy Chanukkah the way we would have had our dad still been with us.